Ignatius Wunderlin was born on 28 October 1848 at Wisconsin. He married Catherine Fure circa 1874. Ignatius Wunderlin died on 16 September 1898 at age 49. Name Variation William S. Wunderlin was also known as Willie S.
William S. Wunderlin married Margaret Regina Reynolds. William S. Wunderlin was born on 26 December 1882 at Harrison, Grant, Wisconsin. He was the son of Ignatius Wunderlin and Catherine Fure. 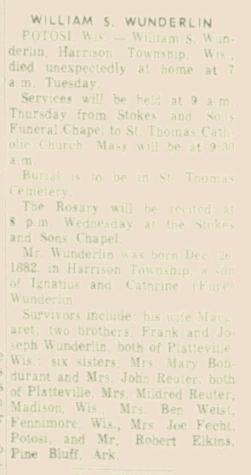 William S. Wunderlin died in May 1955 at Harrison, Grant, Wisconsin, at age 72 William S Wunderlin obituary. Married Name Her married name was Weist. Margaret S. Wunderlin married Ben Weist. Margaret S. Wunderlin was born in May 1884 at Wisconsin. She was the daughter of Ignatius Wunderlin and Catherine Fure. Margaret S. Wunderlin died after 1955. Married Name Her married name was Elkins. Elizabeth Jane Wunderlin married Robert Elkins. Elizabeth Jane Wunderlin was born on 2 August 1888 at Grant, Wisconsin. Elizabeth Jane Wunderlin died after 1955. Name Variation Peter Leo Wunderlin was also known as Peter H.
Peter Leo Wunderlin was born on 3 March 1890 at Wisconsin. Peter Leo Wunderlin died in July 1903 at age 13. Name Variation Mildred Bertha Wunderlin was also known as Bertha Mildred. Mildred Bertha Wunderlin married Edward Peter Reuter, son of Peter Joseph Reuter and Mary Ann Hesseling. Mildred Bertha Wunderlin was born in March 1894 at Wisconsin also reported as Mar 1896. Mildred Bertha Wunderlin died in 1985. Name Variation Rosa May Wunderlin was also known as Rose M.
Married Name November 1920 As of November 1920,her married name was Reuter. Rosa May Wunderlin was born on 20 July 1898 at Grant, Wisconsin. 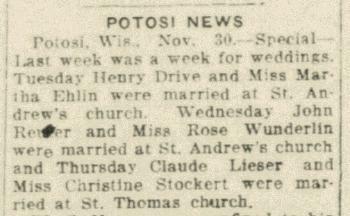 Rosa May Wunderlin married John Jacob Reuter, son of Peter Joseph Reuter and Mary Ann Hesseling, in November 1920 at Grant, Wisconsin, Rose Wunderlin and John Reuter marriage announcement. Rosa May Wunderlin died on 4 December 1973 at Platteville, Grant, Wisconsin, at age 75. Married Name Her married name was Bondurant. Mary L. Wunderlin married (?) Bondurant. Mary L. Wunderlin was born circa 1878 at Wisconsin. Mary L. Wunderlin died after 1955. Name Variation Louisa Catherine Wunderlin was also known as Catherine. Married Name 23 January 1912 As of 23 January 1912,her married name was Reuter. Louisa Catherine Wunderlin was born on 17 July 1879 at Grant, Wisconsin. Louisa Catherine Wunderlin married Henry Joseph Reuter, son of Peter Joseph Reuter and Mary Ann Hesseling, on 23 January 1912. Louisa Catherine Wunderlin died on 27 March 1924 at Grant, Wisconsin, at age 44. Lloyd Tarrell married Susan Cross. Married Name Her married name was Tarrell. Susan Cross married Lloyd Tarrell. Married Name Her married name was Wilkins. Melda Tarrell married (?) Wilkins. Melda Tarrell was born on 11 September 1916 at Wisconsin. She was the daughter of Lloyd Tarrell and Susan Cross. (?) Wilkins married Melda Tarrell, daughter of Lloyd Tarrell and Susan Cross. Jack Tarrell was the son of Lloyd Tarrell and Susan Cross. Jack Tarrell died before 2005. Frank Tarrell was the son of Lloyd Tarrell and Susan Cross. Frank Tarrell died before 2005. Married Name Her married name was Langkamp. Emma Fure married George Bernard Langkamp, son of Henry S. Langkamp and Anna Gertrude Reuter. Emma Fure was born in 1900 at Wisconsin. She was the daughter of Anthony Fure and Elizabeth Reuter. Emma Fure died in 1954. In October 1929 at Grant, Wisconsin, Potosi Couple Hosts to Friends, Relatives. In October 1929 at Grant, Wisconsin, Henry and Elizabeth (McClain) Langkamp entertained friends and relatives at their home, including McClains, Langkamps and Kreisers. Married Name June 1946 As of June 1946,her married name was Stuart. Edna G. Langkamp was born on 15 October 1926 at Grant, Wisconsin. She was the daughter of George Bernard Langkamp and Emma Fure. Edna G. Langkamp married Matthew R. Stuart in June 1946 Edna G Langkamp and Matthew R Stuart engagement announcement. Edna G. Langkamp died on 9 April 2002 at Dubuque, Iowa, at age 75. Ervin Henry Langkamp was born on 8 March 1929 at Wisconsin. He was the son of George Bernard Langkamp and Emma Fure. Ervin Henry Langkamp died on 12 February 1990 at Grant, Wisconsin, at age 60. Joseph A. Droessler was born on 25 August 1955 at Wisconsin. He was the son of Joseph Calvin Droessler and Henrietta Dresen. Joseph A. Droessler died on 1 December 2010 at age 55 Joseph A. Droessler, age 55, of Potosi, died on Wednesday, December 1, 2010, surrounded by his loving family at his home in Potosi. He was born on August 25, 1955 in Lancaster, the son of Joseph and Henrietta (Dresen) Droessler. Joe graduated from Potosi High School in 1973. He married Luann M. Schaefer on May 15, 1976 at St. Andrew Catholic Church in Tennyson. Joe was employed at John Deere in Dubuque for over thirty two years, retiring in 2005. Joe enjoyed being outdoors and helping others. He taught hunter safety courses for many years. Surviving; his wife, Luann, Potosi; a son, Josh (Sarah) Droessler, Dickeyville; a daughter Kylie (Ben) Burns, LaCrosse; two brothers, Tom (Mary) Droessler, and Andy (Dawn) Droessler; two sisters, Mary (Pat) Hawes, and Angie (Steve) Vogelsberg, all of Potosi, and many nieces and nephews. He was preceded in death by his parents Joseph and Henrietta Droessler. Joseph Sturm married Antoinette Clasen. Joseph Sturm was born circa 1882 at Iowa. [S250] U.S. Federal Census 1930 U.S. Federal Census, by Ancestry.com, Year: 1930; Census Place: Jackson, Jackson, Iowa; Roll: 660; Page: 1A; Enumeration District: 10; Image: 222.0; FHL microfilm: 2340395. Married Name Her married name was Sturm. Name Variation Antoinette Clasen was also known as Nettie. Antoinette Clasen married Joseph Sturm. Antoinette Clasen was born circa 1886 at Iowa. Name Variation Josepha M. Schaefer was also known as Shaefer. Married Name before 1923 As of before 1923,her married name was Droessler. Josepha M. Schaefer was born on 21 December 1901. She was the daughter of (?) Schaefer and Josephine (?). Josepha M. Schaefer married John Andrew Droessler, son of Joseph Droessler and Caroline Wiederholt, before 1923. Josepha M. Schaefer died on 27 December 1983 at age 82. She was buried after 27 December 1983 at Immaculate Conception Church Cemetery, Kieler, Grant, Wisconsin. Justin Droessler was born circa 1932 at Wisconsin. He was the son of John Andrew Droessler and Josepha M. Schaefer. Justin Droessler died before 2010. Geneva Droessler was the daughter of John Andrew Droessler and Josepha M. Schaefer. Geneva Droessler died before 1939. Josephine (?) married (?) Schaefer. Josephine (?) was born circa 1874 at Wisconsin. (?) Schaefer married Josephine (?). (?) Schaefer died before 1940. Married Name Her married name was Scheckel. Name Variation Marcella Sturm was also known as Sally. Marcella Sturm married (?) Scheckel. 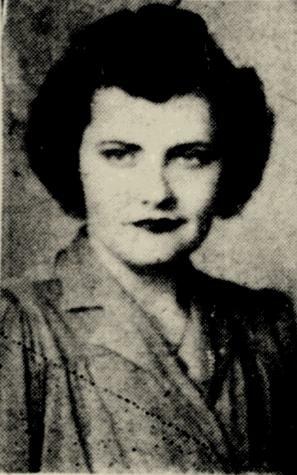 Marcella Sturm was born circa 1907 at Iowa. She was the daughter of Joseph Sturm and Antoinette Clasen. Marcella Sturm died before 2013. Vincent Sturm was born circa 1925 at Iowa. He was the son of Joseph Sturm and Antoinette Clasen. Vincent Sturm died before 2013. Arnold Sturm was born circa 1928 at Iowa. Arnold Sturm died before 2013. Alfons Sturm was born circa 1916 at Iowa. Alfons Sturm died before 2013.